Polymath is the Greek word for a Renaissance person like Leonardo Da Vinci or Ben Franklin who excels in many disciplines. The New Polymath is an enterprise which has learned to amalgamate 3, 5, 10 strands of technology-infotech, cleantech, healthtech, nanotech, biotech-to create compound new products and to innovate internal processes. 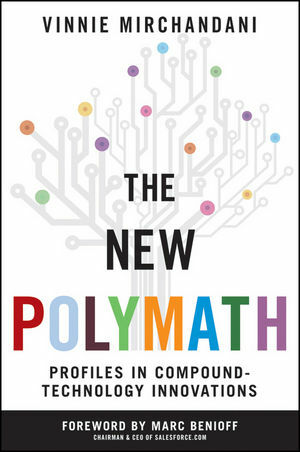 The New Polymath brims with innovation examples from a variety of industries, countries and business processes. Vinnie Mirchandani, who goes by the moniker of "Deal Architect," coaches enterprises on how to exploit disruptive technology trends. His firm has been recognized in The Black Book of Outsourcing as a top advisory boutique. He is also a prolific blogger, writing about technology-enabled innovation on his "New Florence, New Renaissance" blog and about waste in technology on his "Deal Architect" blog. Earlier in his career, he was a respected analyst at Gartner, the technology research firm, and handled numerous international assignments at PwC Consulting. He has keynoted at many business and technology conferences and has been quoted in the Wall Street Journal, BusinessWeek, The Financial Times, CIO Magazine, and other executive and technology publications.